This “Oriental” cookbook written in 1960 has slowly become one of my most-used cookbooks when I need something quick but interesting. It covers a variety of recipes form the “exotic cookery of the Orient” which includes the Pacific Islands to India to China. Myra Waldo is also the author of the invaluable “Casserole Cookbook” that I find so useful for crockery cooking. Here, in a book subtitled “exotic cookery from The Orient”, she presents a wide variety of simple and tasty recipes from the East. There are elleven “countries” presented: Hawaii, including the Pacific Islands, Japan, Korea, the Philippines, Indonesia, China, Indochina, Malaya, Thailand, Burma (now Myanmar), and India. In the Pacific Islands there is a lot of fish and shrimp, and a good amount of pork and pineapple. There is beef as well, such as in “I’o Pipi Luau Me Wai Niu”, which is braised beef and spinach in coconut milk with ginger thrown in to give it that exotic flavor. “Pickled Pineapple” looks to be an interesting chutney-style relish, taking advantage of the acidity of pineapple to can for long-term storage. The section on Japan starts out with a recipe for miso, or more specifically for a miso substitute made with beer, vinegar, and white beans. This is probably the second-largest section of the book, starting with a large number of soups (scrambled egg soup, fish-ball soup, watercress soup, for example), and moving on to fish, clams, scallops, and shrimp. Spinach salad (aemono) is extremely simple and tasty: make a dressing of sesame seed paste, soy sauce, and oil, and pour over cooked spinach. On Korea’s favorite pickle: ”A fully ripened kimchee is an experience--often, best avoided.” After that, she does provide one kimchee recipe, “salted greens”, which only takes five to seven days to ripen. I’ve only had the nerve to make kimchee once, and not from this recipe. It was extremely tasty. One friend said “I never like kimchee, and this is tasty”. But, she always says that at Korean restaurants too. I’ve never seen her not like kimchee, even though she never does! I have not tried the pork dumplings yet, but they look like they’d be great “browned lightly in oil”. The Philippine corn soup is my favorite recipe from the entire book. It is an extremely simple shellfish soup: shrimp and clams, and I’d argue that scallops would also be a good addition. To this you add corn and either spinach (my favorite) or watercress, and you’ve got a great, incredibly tasty soup in about half an hour. The Philippines have some of the more interesting desserts as well, such as coconut tart and (coconut) custard with caramel syrup. China fares very well: “It has been said by gourmets that the world has three great cuisines: French, Italian, and Chinese.” Where Texas barbecue fits she doesn’t say, probably French. This is the largest section of the book, with recipes ranging from shark’s fin soup to Manchurian-style Eggplant and Pork. You can prepare your own five-spice mix with anise, cinnamon, star anise, cloves, and fennel, in equal amounts. (I find this good on popcorn as well.) There are a number of dumplings here requiring varying degrees of skill, depending on how they are to be filled. ”The designation Indochina can only be sanctioned on a gastronomic basis, for French Indochina no longer exists as a nation. In its place are Cambodia, Laos, North, and South Vietnam.” Since this book was written, North and South Vietnam have apparently consolidated. Pineapple Fish Chowder, with orange, anise, saffron, and shrimp along with the pineapple and fish, is very flavorful. Even Pork and Tripe Stew has shrimp in it; I haven’t tried that one, not being particularly enamored of tripe or liver (the stew also calls for beef liver). While the French left their flavor in Indochina, the British, according to Waldo, did not leave any trace “of British cuisine (if indeed the British have a cuisine)... with the Malayas”. Probably because “the cooking style of the country is based upon well-flavored dishes”. Ouch! Now we’re moving towards curry country: Fish and Green Bean Curry, Fish in Coconut Curry Sauce, Lobster Coconut Curry among the beef and coconut. Thailand brings us closer to curry country, although Waldo includes only one curry recipe after claiming that every meal will have some. It is, however, an interesting curry of chili peppers, black pepper, caraway, coriander, salt, cabbage, shallots, garlic, lemon rind, and basil. Oranges stuffed with pork is intriguing, but I’m not visualizing her instructions very well. I’m not sure what I’d do with “Golden Silk” either, where you take egg yolks and funnel them into a syrup mixture; you’re supposed to end up with silken strands. I’m sure I’d end up with yolky syrup. ”Of all the peoples of the East, the Burmese have succumbed least to the pressures and tensions of the twentieth century.” Of course, this was 1960 to 1965, and the people of Myanmar probably disagree today, with their political turmoil and ignored elections. Cucumber salad (with cooked cucumbers and tumeric), lime pickle, and mushroom curry, fish croquettes in coconut cream, makes this section unique. Pumpkin soup (with shrimp, shrimp is everywhere in this book, and what’s wrong with that?) is an interesting combination of pumpkin or squash and anchovy, onions, and chili peppers. In India, samosas are apparently made with yoghurt. I’ve found that yoghurt is a great substitute for milk in many, if not most, bread recipes. (This isn’t because I don’t like milk, but because I don’t drink it often, and most bread recipes only call for a little milk. The rest of the milk invariably goes bad in my refrigerator. Yoghurt simply lasts longer.) This is, of course, curry country, and we have Chicken Curry (with coriander), Curry with Dumplings (lots of ginger), Lamb Curry (cloves), Potato Curry (turmeric), and a generic Curry Sauce made with Indian curry powder. There are inevitably substitutions made, but for a cookbook written in 1960 it remains amazingly true. Waldo included a short list of places to order “exotic” ingredients in the back of the book. Most likely long since not useful, but the web has more than compensated. This has slowly become one of my most-used cookbooks when I need something quick but interesting. Bake eggplant at 350 degrees one hour. Sauté onions and peppers in the oil five minutes. Rinse coconut under cold water. Chop together eggplant, vegetables, coconut, salt, chili pepper. Blend in cream and lemon juice. If you enjoy Asian, you might also be interested in Classic Chinese Cuisine, Corn and clam soup, and The Art of Korean Cooking. If you enjoy cookbooks, you might also be interested in A Concise Encyclopedia of Gastronomy, Bull Cook Historical Recipes, Cavalier Cooking, Classic Chinese Cuisine, Cooking the Bahamian Way, Country Commune Cooking, Life, Loves, and Meat Loaf, The Art of Korean Cooking, The Casserole Cookbook, The Complete Bread Cookbook, The Frugal Gourmet Celebrates Christmas, The Healthy Cuisine of India, The New Larousse Gastronomique, Saucepans and the Single Girl, The Northwest Cartoon Cookery, Good Food From Mexico, Laurel’s Kitchen, The Cooking of Vienna’s Empire, James Beard’s Fireside Cook Book, French Bistro Cooking, A Fifteenth Century Cookry Boke, Crockery Cookery, Southern Cooking, The Frugal Gourmet Keeps the Feast, The Fannie Farmer Cookbook, French Cooking Simplified With a Food Processor, In Good Taste, Heritage of America Cookbook, Our Favorite Hometown Recipes Vol. II, The Indian Spice Kitchen, Japanese Country Cookbook, La Cuisine Française, Larousse Treasury of Country Cooking, The Natural Foods Cookbook, A Russian Jew Cooks in Peru, Soul Food Cook Book, The Tassajara Trilogy, Pains Spéciaux & Viennoiseries, Whole Earth Cookbook, The Wok: a chinese cook book, Southern Living Cookbook for Two, Lebanese Cuisine, The Art of Syrian Cookery, Popular Greek Recipes, In a Persian Kitchen, The Art of Pennsylvania Dutch Cooking, and The Southern Living Cookbook Library. If you enjoy Myra Waldo, you might also be interested in The Casserole Cookbook. For an “Oriental” cookbook written in 1960 it remains amazingly useful. This has slowly become one of my most-used cookbooks when I need something quick but interesting. 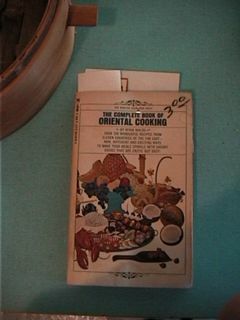 The Complete Book of Oriental Cooking last modified May 25th, 2009.